The summer season has officially closed down and so the end of another great year is in sight. Time to end 2009 with a blast, Armin van Buuren must have thought. The Dutch DJ/Producer is able to look back upon an eventful but more than successful year. The number one DJ won the award for Best International DJ at the DJ Awards, received 4 International Dance Music Awards and received more than 33 million views for his ‘In & Out Of Love’ music video on YouTube. But despite all awards, accolades and admiration, it’s still the music that gives him the perseverance and inspiration to carry on in these times of pressure. Once again, Armin didn’t spent his time in the studio just by himself. After collaborations with Roger Shah, Chris Jones, Sharon den Adel and Jacqueline Govaert, it’s now time for Dutch singer Roel van Velzen to impress us with his voice. VanVelzen has build a steady fan base after he hit in with ‘Baby Get Higher’ at the end of 2006. In the meanwhile, he’s released a platinum debut album and eight successful singles, received four awards and made name as a singer/songwriter with a strong performance. The two of them had an inspiring time in the studio, with ‘Broken Tonight’ as the trancy result. 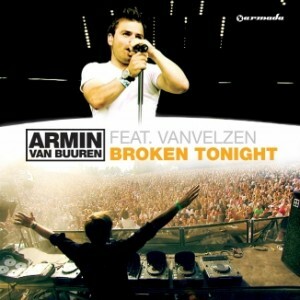 VanVelzen’s strong voice and sustained note in the break send shivers down your spine time after time, while Armin’s maze of beats, rocky guitar loops and melodies will get you lost inside this dancefloor highlight.